Chemistry: CaAl2Si6O16 - 5H2O, Hydrated calcium aluminum silicate. Goosecreekite is one of the rarer zeolites and one of the most usually named minerals in the world. It is named after the quarry from where it was first described, Luck Goose Creek Quarry in Loudon Co., Virginia. It forms irregular aggregates and prismatic crystals that are found in the vesicles or bubbles of volcanic rock as are most other zeolites. Goosecreekite is a rare mineral and is sought after by collectors of rare zeolite minerals. Zeolites are known to have an openness about their structure that allows large ions and molecules to reside and actually move around inside the overall framework. The structure actually contains open channels that allow water and large ions to travel into and out of the crystal structure. The size of these channels controls the size of the molecules or ions and therefore a zeolite can act as a chemical sieve, allowing some ions to pass through while blocking others. Color is clear and/or white. Crystal Habits include prismatic, irregular and blocky crystals. Twinning is common and results in parallel growth. Specific Gravity is approximately 2.4 - 2.5 (light). 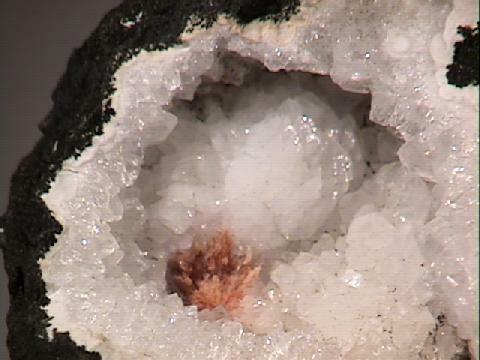 Associated Minerals are quartz, calcite, epistilbite, heulandite, stilbite and other zeolites. Notable Occurrences include Poona, India and Luck Goose Creek Quarry in Loudon Co., Virginia. Best Field Indicators are crystal habit, density, hardness and associations.